I had the privilege of trying this delicacy for the first time last year. As much as I hate to say this, I actually kind of like it. A lot. And I have a few little secrets that make it even better. 1. Red pepper flakes, and lots of ’em. I apologize in advance for the photo. I think it’s dang near impossible to take an appetizing photograph of this monstrosity of a meal. Sauté the onion in a large pot until cooked. Add ground beef and cook until browned. Mix in green beans, corn, and soup. Stir in red pepper flakes until well-distributed. 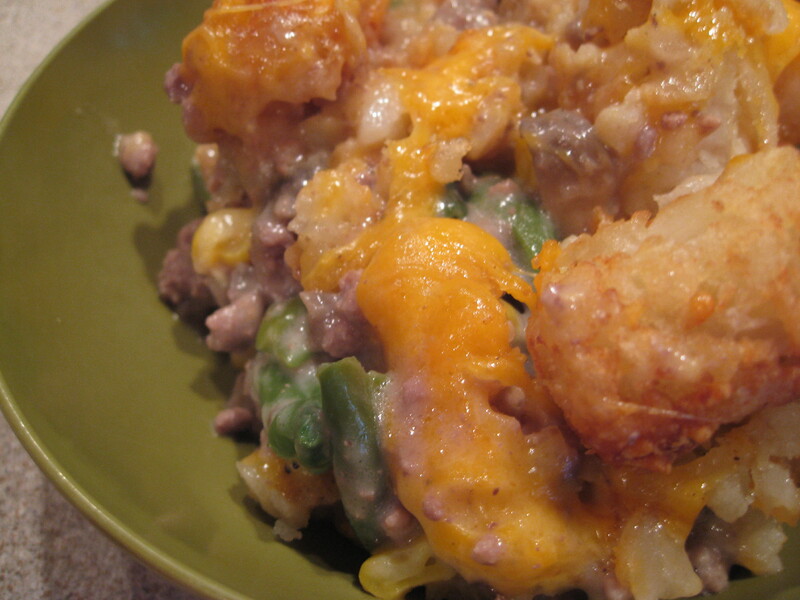 Spread mixture into a casserole dish and top with tater tots. Bake 30 – 45 minutes, or until tots are golden brown and casserole is heated through. Top with cheese and broil until the cheese is golden brown and bubbly. Categories: Beef, Main Entrees, Meat, Quick & Easy | Tags: beef, cheese, main dish, meat, potato, quick and easy | Permalink.